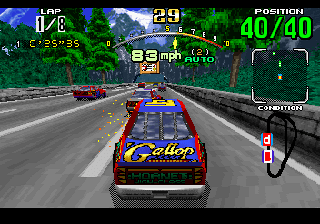 Released as a launch title on the Saturn, Daytona USA was a home port of Sega’s wildly popular 1993 arcade hit of the same name, and is one of the defining titles on the console. The arcade-style racer includes three tracks of increasing difficulty and the option of a stock car with either an automatic or manual transmission. The beginner course is predictably boring, but the two advanced courses are both well designed and fun to race on. The game can be played in original arcade mode, in which checkpoints must be reached before time runs out, or in “Saturn mode” which eliminates the time requirement to reach the checkpoints. Saturn mode also adds the option choosing one’s car color, while arcade mode has only one. Additionally, the game can be played in either normal, Grand Prix, or endurance mode, which affects the number of laps per race. Cars can be damaged in the game which has an effect on performance, but this can be remedied by making a pit stop. The graphics are detailed and the colors really pop out, but the game does suffer from some pretty bad draw-in. While this doesn’t detract from my enjoyment of the game, it will be instantly noticed by veterans of the arcade version. The game suffers a frame rate drop from 60fps in the arcade to only 20fps on the Saturn, but this is forgivable in a home console game of this age. The game also features 5 difficulty settings. The game is easily accessible to beginners at the normal setting, but the ability to ramp up the difficulty adds to the replay value for more seasoned players. Daytona USA is a fun racing game that is a must-have for any Saturn owner. The game was overshadowed by other arcade racers in the 32-bit generation, most notably the Ridge Racer series, but it is still a great game in its own right. Buy Daytona USA on GameGavel or Amazon. Tagged 1995, Arcade, Daytona USA, Racing, Review, Saturn, sega. Bookmark the permalink.